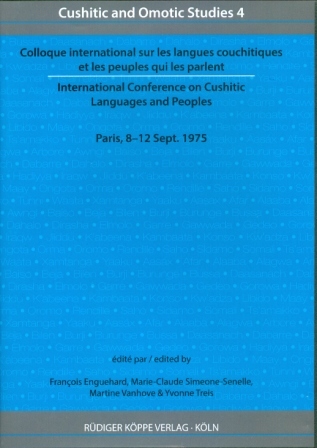 The present volume is a selection of the papers presented during the 1st International Conference on Cushitic Languages, Paris, 8-12 September 1975. Some thirty scholars gathered, coming from several African, European and American countries: Djibouti, Ethiopia, and Sudan (where these languages are spoken), Czech Republic, France, Germany, Italy, Poland, Russia, United Kingdom, and United States. The conference rested ignored, and the issues have never been announced since now: due to a lack of funds, the contributions are published only now, 40 years after the conference has been held. The papers are grouped thematically, in order to underline the consistency of the debates that took place during the meeting. Moreover, mp3-audio files that contain 24 hours and 6 minutes of the public presentations are presented on the DVD. Furthermore, and original con­tributions of scholars amounting to 97 minutes are attached to the texts.